Australia Bound… in 3 1/2 months. Well, it is official. I've booked the airline tickets for a trip to Australia. I get to go down under to visit my honey. Hopefully by the time I get there it will be a one-way trip, but I do have a returned flight booked just in case. I am traveling down with my Mom. This should be pretty exciting for her as she has never left the country before (except for a couple of the northern United States). We leave Edmonton the afternoon of June 4th and arrive in Brisbane the morning of June 6th. We do loose a day to the International Date Line, so that isn't as quite bad as it sounds. It is about 22 hours and 9800km of flying though. The flight down connects through Denver, Los Angeles and Auckland before arriving in Brisbane. We booked the trip to coincide with the end of Barb's mid term exams and her three week winter break. Once we get there, Mom wants to diving in the Great Barrier Reef and whale watching. Since she's almost 70 and has just flown for 22 hours, she gets to do whatever she wants. 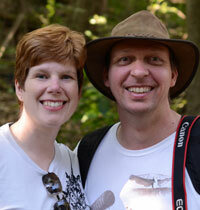 We are going to go back to the Lone Pine Koala Sanctuary again and maybe the Australia Zoo. We don't have much of the trip planned yet. My main reason for going is to see Barb. So basically we will go see whatever Mom wants. To return, we leave Brisbane on the 22nd and fly to New Zealand. We planned to stay a few days on the North Island, see the sights and then leave from Auckland on the morning of the 28th. If the Australia Immigration department has played nice with me, Barb & I will send Mom off for the long flight back to Vancouver and Edmonton. Then we will fly back to Brisbane. If the visa hasn't come through, I will be flying back with Mom and Barb will fly back to Brisbane by herself. Due to the Date Line again, we will arrive in Edmonton six minutes before we leave Auckland. We actually arrive in Vancouver six hours before we leave Auckland. In other news, I have just one week left at Panasonic. Apparently all our customers should be getting letter soon stating that CBS (link) has taken over the business and the Panasonic branch will no longer be around. Dan and Lorie have been pulling out their hair trying to get things closed down. All our copier stock is slowly making it's way to either the Richmond or Toronto office. Tomorrow we are having a pizza lunch. We have some money in our social fund that we have to burn through before the end of next week. It will be an odd ending to job; half the staff is moving to the new company, I'll have the same customers and machines, the same paycheck but with a new logo in the corner. I also have about 80% of my box of business cards left. If any body wants one of may business cards, just contact me :-). That's about all for now. God bless. If God ever forgives me for moving to Aus, I SWEAR I’ll never do it again! This week has been cruddy. I've gotten about $250 worth of parking tickets that I was unaware I had until the "We're about to take you to court" notices started showing up. My fault, I failed to read the fine print on my residential permit- I can't park in a pay zone. Unfortunately, of the 3 streets I am allowed to park on, none of them has any NON-pay zones. So I am parking the car in the next suburb over, New Farm, about a kilometer's walk away. Last Saturday night, the Destroyer was broken into down there, and my camera and GPS power supply were stolen. NUTS! On Wednesday night, the Destroyer died...AGAIN... but this time in the middle of downtown, in the middle of evening rush hour. I waited an 40 minutes for a tow truck, and endured varying levels of verbal abuse from my fellow motorists. The car was towed to a garage, and I finally got home at 8 pm. It is going to cost $350 to fix, as the fuel pump is to blame. DOUBLE NUTS!! As I was down to $11 in the bank account, I have to dip into my tuition money for next semester. Not good. On the bright side, the car CAN be fixed (not ready for the scrap yard yet),Rob is coming June 6th, and the house is sold. God loves me, I'm doing what I've always wanted to do, and it's all going to be OK. WHEW! Oh, yah. Brady and I now have ADSL to the flat, which means the Vonage phone ACTUALLY works now. yay! Thanks for the thoughts and prayers, everybody. A few people have asked about the bushfires and if I'm anywhere near them. No, I am at least a day and a half's hard drive from being anywhere close. But these people DO need your prayer and support. Many people have died trying to flee the fires, hospitals have run out of morphine to tend to burn victims' pain, and the land is black. One car was found incinerated with 6 people inside. Those that have managed to evacuate are without most basic supplies, as returning to the house usually meant you were added to the death toll. It is estimated that over 180 have died, 2000 homes are destroyed and 7,000 people are displaced, so far. 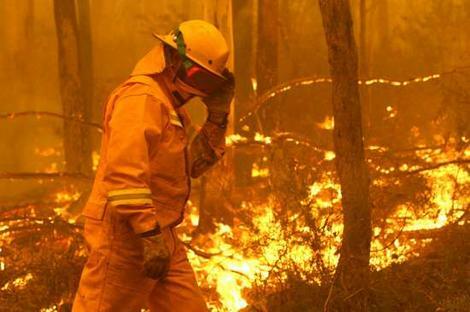 What is the most sickening thing about it is that some of the bushfires were delibrately lit, and some were even RE-lit after firefighters had finally gotten an area under control. So far one man has been arrested. The Prime Minister describes it as "mass murder". The fires were aggravated by the recent heat wave (up to 45 dgrees Celcius!) and whipped up by fierce winds. Looking at pictures of the firefighters working on the blaze, many of them volunteers, I can only imagine how overheated they must be in their coveralls. Very brave folks. Donations can be made to your local Red Cross. Any Aussies can also make blood donations, as they are in a state of critical need for blood for burn victims(especially O neg). Queensland, on the other hand, is going through some major flooding, especially in the far north and central regions. Again, Brisbane is not affected. But let your thoughts be with the ones who are. Thanks. I happened to win a raffle from first week, resulting in me becoming the proud owner of an Ultrascope. My first thought was "what the heck is an Ultrascope?!!?" I had to look it up on the internet. Turns out it's a super sensitive stethoscope that works on pressure more than your average scope. And it works especially well for those who are hard of hearing (ahem. WHAT?) So I had an appointment to pick it up from the med student union office (UQMS) on Tuesday afternoon. I figured (correctly) that there would probably be a picture involved. So I attempted to dress up a little nicer than usual. I even wore nice sandals instead of my runners. On the way up the hill to my Microbiology practical, I realized that they will not let you into the lab without closed shoes (with good reason). Nuts! I came up with a solution- I ran to the bookstore and purchased a disposable lab gown ($2.50). They won't do a debit transaction under $10, so I grabbed yet another plush microbe (#26- Varicella- www.giantmicrobes.com). Gah! I ran back to the lab and went to work. I ripped off the sleeves, and with some rubber bands fashioned booties! Now my feet were covered. Unfortunately, no dice. I was kicked out of lab! I have never been asked to leave a class before. I felt like such a rebel. Fortunately, I could make up the session the next day. So I did. That's my story and I'm stickin' to it. Well this has been an interesting month. First, the condo is now sold (MLS listing - Agent listing). All the sale conditions are now fulfilled. The possession date is now March 6th. Hurray, it's finally sold. Second, I've had an exciting career changes. Panasonic decided to close our branch. Apparently, they decided that wanted to change their business plan and closed Calgary as well. The last day is February 27th. But in a twist, the company that is taking over the service has hired me plus three other co-workers. The pay and benefits will be pretty much the same. They do know I will be leaving when I get my Australian visa. I had to agree to a minimum of three months, but I think that is pretty reasonable. In fact, the new company has been very good about everything. It seems like it will be a good place to work. On the plus side it is closer to home. On the downside I have to start work at 8:00 instead of 8:30. I can hear all you 8 o'clock people saying "SHUT UP", but I will miss that 1/2 hour sleep in the morning. So in the end this worked out pretty well. Panasonic is paying a decent severance package, I keep working and I can leave in June if my visa is in. Not a bad deal. Talking about June. Mom & I are planning to head to Australia for about 3 weeks round about June 5th. Barb has a school break then. Hopefully Mom will have to fly home by herself. In completely unrelated news, I had two fillings come loose. The dentist glued one back in (with terrible tasting glue). The other will need to be a crown or implant. We will see what the insurance people say. That's about it. Some days I wish I had a nice quite life. That's never gonna happen is it? I then stopped over in Chinatown, 2 blocks from my place, and took in the Lion dance and pole routines for ushering in the Year of the Ox. Lots of people, colour and firecrackers!!! Last event was the fireworks, which were launched from a boat in the Brisbane River around SouthBank. A pleasant day altogether. It is still raining, but no one seems unhappy about it, as Brisbane has been in a drought for a decade already. There has been enough rain to warrant flood warnings on the Gold Coast. Most of the areas around the city have already relaxed their water restrictions. This has been a week of practical classes, or “pracs” as we call them. I had histology, anatomy, physiology and microbiology. So I finally got to work with cadavers!!!! Those that know me know that I’ve been wanting to do this for years. The other pracs were useful, but not near as interesting. I always wondered what my reaction would be to my first Gross Anatomy lab. Would I faint? Throw up? Or some gruesome combination of the two? Instead, I found myself utterly FASCINATED and loved everything about it but the smell. The formaldehyde seeps into anything porous, which is great for preserving tissue. But it also gets in your skin, clothes, hair…and well, you get the picture. It comes home with you. Yum, yum! So that was definitely a highlight for me. It also makes this med school experience very real. People don’t let you play with thoraces and fully muscled thighs of the very generous departed unless you are going to be a health professional. Wow! I must say though, how red meat looks like red meat, no matter the source. I’m just sayin’….